The documentary follows the lives of six LGBT seniors living in the Boston area who must choose if they will hide their sexuality in order to survive in the long-term health care system. The film was screened Tuesday at Trinity Episcopal Church [503 Asbury Avenue] as part of Garden State Equality’s [GSE] SAGETable event. Through SAGETable, GSE wants to bring the community closer, lessen the loneliness in the lives of LGBTQ seniors and empower those to share stories, and brainstorm ideas. GSE hopes that events such as these will bring them closer to accomplishing those goals. Christian Fuscarino, executive director of Garden State Equality, speaks to the group gathered to discuss elder LGBTQ healthcare issues during a SAGETable event, held at Trinity Church in Asbury Park, NJ, Tuesday. “I would love for viewers to take away from the documentary that LGBTQ people – regardless of age-need more support than non-LGBTQ people,” said program facilitator Bianca Chanel Mayes, GSE’s MPH Health and Wellness coordinator. “After viewing ‘Gen Silent’, GSE hopes to generate conversations around LGBTQ aging issues to other LGBTQ organizations, the healthcare industry, the general public, and older adult facilities [long-term care, etc]. “Using this documentary is a great tool to show to older adults because a lot of them that are non-LGBTQ, aren’t aware that there is a generation of people alongside them that are aging right next to them,” Mayes said. SAGE, a national advocacy and service organization, has 30 affiliates in the United States. 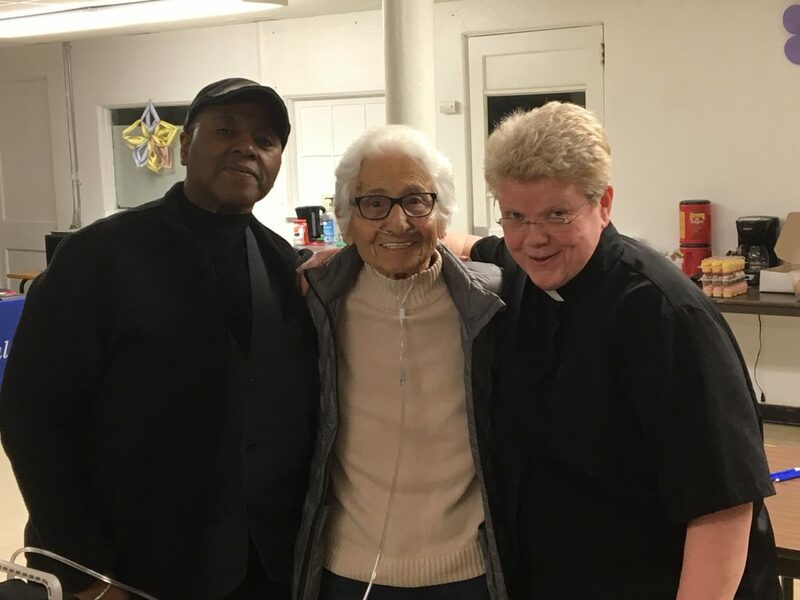 Its mission is to ensure there is always visibility for the elder LGBTQ community and to continue to look out for the healthcare needs of that community. 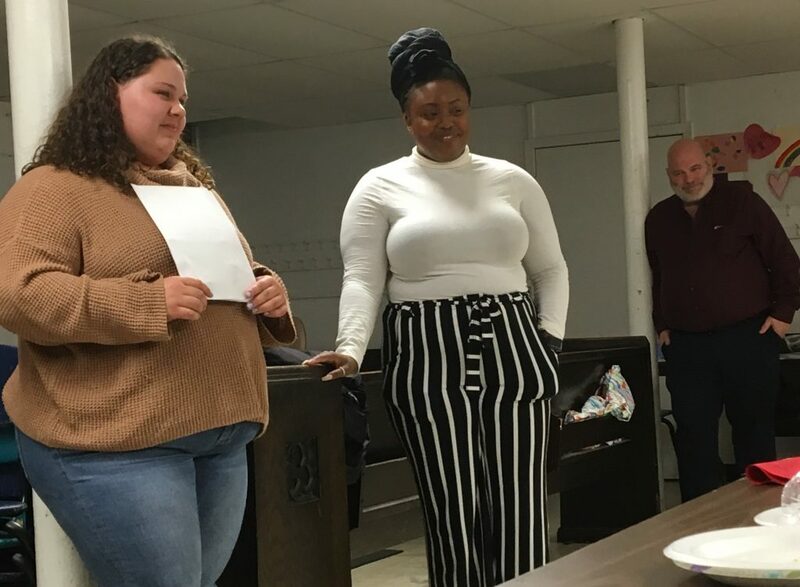 Francesca Petruzzella, intern, and Bianca Chanel Mayes, MPH, Health and Wellness coordinator, both for Garden State Equality, and Sal Susino, outreach coordinator for Prevention Resource Network, discuss the elder LGBTQ healthcare situation at a SAGETable event held Tuesday at Trinity Church in Asbury Park, NJ. Once the film ended, Mayes, along with co-facilitator Francesca Petruzzella, a GSE intern, led a discussion centered on the documentary’s message and what the community can do to make situations better for its elder members. The group offered some insight. Sal Susino, outreach coordinator for Prevention Resource Network, gave some insight about the healthcare industry and how some members of the community feel about the industry and its treatment of the LGBTQ community. 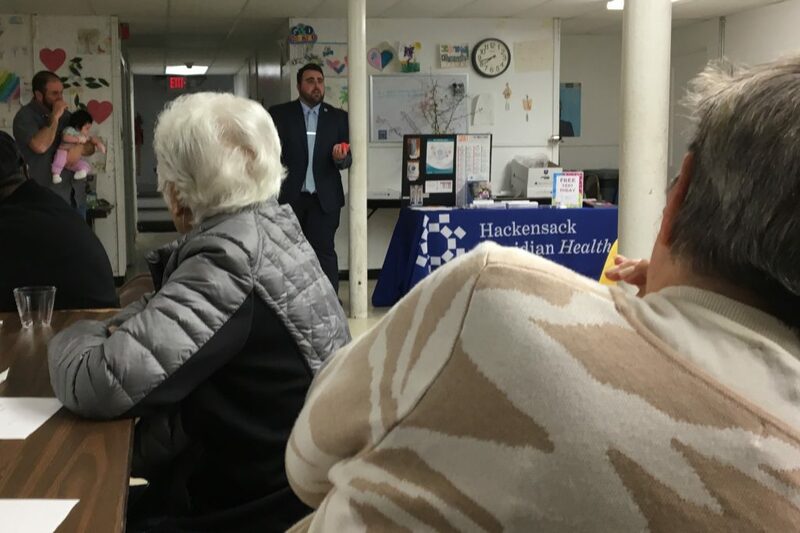 And while the LGBTQ seniors who participated in the needs-assessment expressed feelings of being comfortable with healthcare providers they’ve been using for many years, Susino said he knows a lot of LGBTQ seniors who actually are not happy. 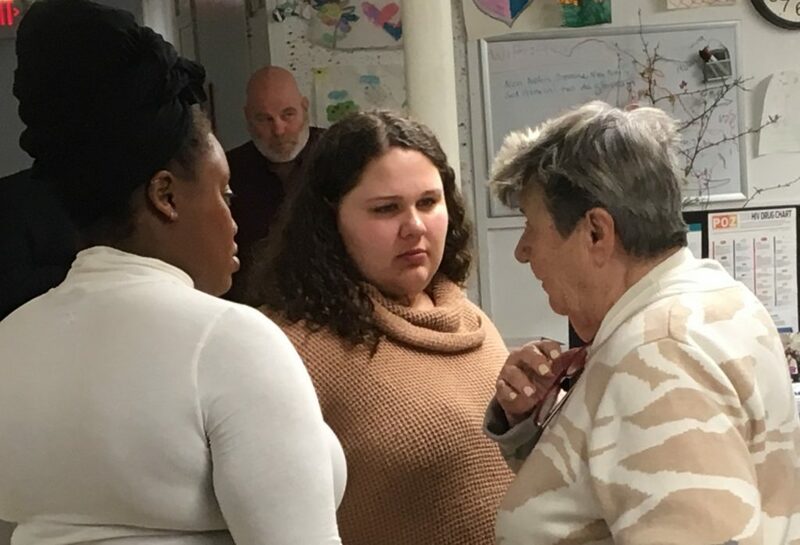 Bianca Chanel Mayes, MPH, Health and Wellness coordinator, and Francesca Petruzzella, intern, both for Garden State Equality, speak with Jan Moore, a resident of Ocean Grove, NJ, during a SAGETable event to discuss elder LGBTQ healthcare issues, held Tuesday at Trinity Church in Asbury Park, NJ. Graeme Davis, an occupational therapist, also related to the film’s message. Mayes said that when the organization shows this film, they want to broaden everyone’s minds and hopefully encourage any closeted LGBT older adults to come out of the closet and/or speak about their experiences. Graeme Davis, an occupational therapist, Emily Sonnessa, a resident of Ocean Grove, NJ, and Carolyn Bradley, deacon at Trinity Church and associate professor of Social Work at Monmouth University, attended the SAGETable event to discuss elder LGBTQ healthcare issues, held Tuesday at Trinity Church in Asbury Park, NJ. To get involved with Sage locally [the NJ affiliate], contact Gordon Sauer at [email protected] or call  342-2360. To get involved nationally visit, the SAGE website to find out how you can volunteer at the NYC SAGE Center, host a SAGETable, become an LGBTQ older adult ambassador, or raise your voice online.